I live in the land of potatoes now, if you didn’t know already, and last week and this one is Potato Harvest. The kids even get two weeks off school, as way back when (within the last generation even) everyone – even kids- helped with the harvest. Trucks and equipment are not only in every field I can see (which is a lot), they are all over the road (more so than usual). There is a distant hum in the background – machinery going back and forth across the fields digging it all up. It’s kind of fascinating, in a way – it’s pretty slick seeing how they control the harvest and get it into storage barns, all in two weeks. Some will be bagged and shipped to stores everywhere, some will head off to the factory to become fries and other potato products. Dust is kicked up everywhere. Traffic warnings are on the radio, reminding motorists to be aware of extra equipment on the road and (this makes me giggle) to watch out for falling potatoes. The field near us is being done today, and I am told we can wander over when they are done and gather up any they missed. There’s a nice collection of harvesting pictures here, if that floats your boat. Modern farming involves a lot of driving around on heavy equipment and not much digging in the dirt. We’re in love with mashed potatoes and with a little help from Paula Dean, came up with one of the best mashed potato recipes there is. Peel and *slice* the potatoes, 8 to 10 – or I do whatever half-fills my big pot. Paula showed me how slicing the potatoes instead of quartering them, made them cook faster and mash easier. Cook & drain, then mash well. Add a stick of butter/margerine and some milk, like a half cup. Beat with the electric mixer, but not too much. Heaven. Paula adds sour cream, too. I didn’t find any unit studies on potatoes, but it sure would be a yummy and interesting one. We’re at the green house, where the strawberry patch is in full production. I had a bowl for lunch. Ron had a bowl, Meaghan had a bowl, I’m pretty sure Emma had some and I know my neighbour came down and picked a bunch to distribute to our elderly neighbours. And then we picked three ice cream containers full. I am not sure if we’ll have any left to take back home, but I know we’re transferring some of the plants to the new house. Specifically, the new runners the plants sent out, because the original plants that are four years old are just about spent. We’ll only need about a dozen. We started with TWO, and we just let ’em grow. eta: And I took off a few of the more summery ones. ETA again:You can see all headers in this directory. Somebody gave me a pile of rhubarb, and by pile I mean the biggest shopping bag you can get, absolutely FULL of the stalks. Problem is, I don’t much like it. So, um, do YOU like rhubarb? Want some? If you’re in the area, lemme know, because I’ll even do it up for you if you come by and pick it up. I’d hate to see it go to waste. I made some rhubarb juice, and my husband is a lucky man, for as he said, his old neighbour used to make juice from rhubarb around twenty years ago, do I think I could make something like that? And that is just one example why I keep old cookbooks around. I like this time of year in my garden. Every day a new surprise unfolds, seemingly just for me. I am also a lazy weeder and forgetful, so you can imagine that some blooms are really surprising. This morning I noticed our orange daylilies have finally bloomed, weeks after the yellow ones, and we luckily had planted some of them (hard to tell with just roots) right next to the blue delphiniums, which have also just sprung forth. It’s quite striking actually. The columbines, which I did eventually move, holding my breath all the while, are blooming again, all purple. I moved a small miniature bleeding heart which was getting trampled, and it has grown more in the past month than it did in the past two years. T e sedum has buds, so do more pink flat flowers whose name I forget, the tall phlox-like plants in white and a mauvey-pink, and the goat’s beard has spring up flowers on long stems, pretending to be Queen Anne’s lace. The blue hydrangea is stumbling along, only one of my stargazer lily bulbs has actually grown a stem with real buds on it (but the other two do have roots on them), and I lost some of my echinachea (coneflower) out front. But the best part is the roses. Oh my, do we have a newfound love of rosebushes. The pure white tea roses are in bloom, the blood-red tea roses have just opened up, the old-fashioned pink wild ones are done but may bloom again in a month, the miniature yellow tea rose has a bud about to burst, and we finally managed to control the thrips on the old (old – maybe the old guy who built this house planted them – old) roses out front. This is the first year that the bush has sufficiently recovered from neglect, road salt, and bugs. The blooms are stunning, double-flowering, with white petals around the outside and blush pink ones in the middle, and you can smell them when you round the corner of the house, easily ten feet away. Bees wander in and are stupefied. 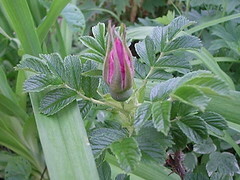 I snipped off a small branch, with four buds on the end, three about to open. I brought it in last night, stuck it in a bud vase, and this morning at least two blooms are open. I had to take the vase outside, since the scent is making my nose run. It’s some pretty though. Pictures soon. I could take pictures of my flowers all day, and sometimes we do. I’ve created a slide show for your enjoyment.